If you thought bungee jumping was restricted to some places in Europe, New Zealand and America, it’s time you got and update. The sport has finally found a natural home in the highest mountain range in the world. The ultimate thrill of a bungee jump can now be experienced in Nepal at perhaps the best site in the world. Nepal’s first bungee jumping site is situated 160m over the wild Bhote Koshi river, and located close to the Nepal-Tibet border, a three-hour bus ride from Kathmandu. As can be arranged on arrival in Kathmandu. As of now, there is only one agency offering this sport. The jump, at 160m, was designed by one of New Zealand’s leading bungee consultants, and is operated by some of the most experienced jump masters in the business. It’s mishap-proof. The agency takes safety “very, very seriously”. Location : Less than 3 hours outside Kathmandu by Ultimate Bungy Shuttle. You will travel the Arniko (Kathmandu/Lhasa) Highway to within 12km of the Tibet Border and the famous Friendship Bridge. 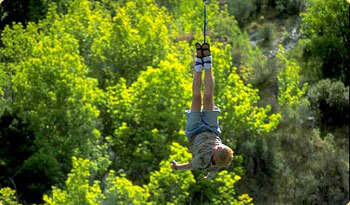 The Gorge : Ultimate Bungy Nepal takes place on a 166m wide steel suspension bridge over the Bhoti Kosi River. The Bridge : Swiss designed, specially for bungy jumping with a 4x saftey factor. The bridge has a loading factor of 250kg per running meter. This means that the bridge will hold 250 x 166 = 41,500kg or 4.5 tonnes. And… those are Swiss measurements! * Over 6000 meters of steel wire was used to build the bridge * Longest suspension bridge in Nepal * The bridge joins two sides of a great valley. Before its construction, locals walked five hours to cross this river gorge.